Butterfly rashes are light pink to deep red in color; varying with the intensity of the condition. 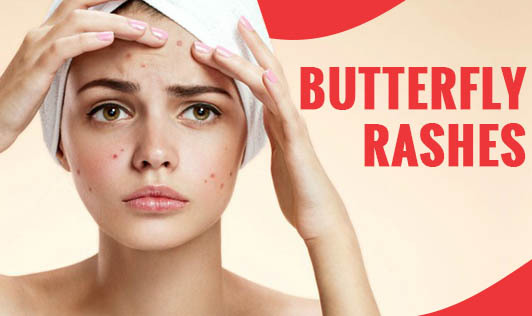 Characteristic to their name, these rashes form a butterfly shape on your face. It appears such that the wings are spread over the cheeks on either side and the centre covers the nose bridge. This is usually caused by a condition called "Lupus". Lupus results when the immune system attacks the body cells itself. Hence, along with the butterfly rash, other tissues also get inflamed. Symptoms include heavy breathing, nausea, vomiting, joint inflammation, hair loss, headaches, fevers, mouth sores, chest pains, lowered urinary output, and reduced concentration. In severe cases, lupus can also lead to other skin infections, skin cancers, cardiac complications, and renal failures. In some cases, butterfly rashes can also appear due to Vitamin B3 deficiency, scarlet fever, and rosacea. Butterfly rashes and other lupus symptoms occur with sudden onset at periodical intervals. For this reason, it is important to carry the prescribed medications and take precautionary measures at all times. Butterfly rashes darken and worsen further during sun exposure. Just in case you are encountering the same, always have a cap/stole handy. Lupus, if untreated can be fatal as well. Moreover, pregnant women with lupus can experience bleeding during pregnancy that can lead to life-threatening complications for the mother and/or child. If you experience similar symptoms and have noticed the butterfly rash, consult a dermatologist immediately.